We also exhibit with a MultiQuad. We love the MultiQuad for all the same reasons our clients do: it is easy to setup yourself, saves on shipping & drayage costs & offers a big custom look. The new 1" deep Thin Wall frames allows exhibitors to reduce shipping and drayage costs even more with a lighter frame that takes even less packing space. Integrated monitors in any size MultiQuad! We know how effective high technology is to your exhibiting, that’s why MultiQuad seamlessly integrates monitors from 19" to up to 60". 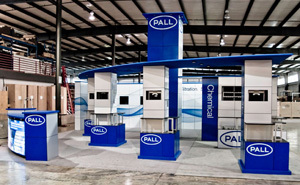 Achieve a look once reserved for custom exhibits, with overhead bridge systems. They easily connect to your MultiQuad wall or tower for a crafty way to promote your message or logo up high. 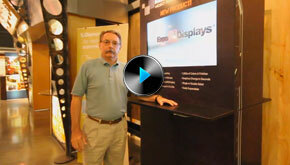 We are continually improving the MultiQuad exhibit system with new innovative accessories. 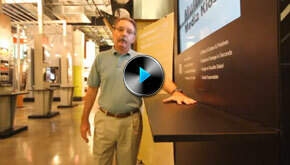 From 16’ towers to locking podiums to product displays showcases we have the tools you need. 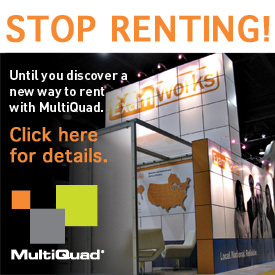 Discover the best rental program on the market with the Always In Stock™ MultiQuad Rental Program. MultiQuad is the last exhibit you’ll ever have to buy. It consists of interchangeable frames and Quads™ providing the freedom to change configurations and finishes in seconds. Sizes from 10’ x 10’ to 100’ x 100’. Entire 20’ x 20’ Packs in 1 Crate! Discover how much MultiQuad you can pack in one crate to help lower your shipping and drayage expenses. 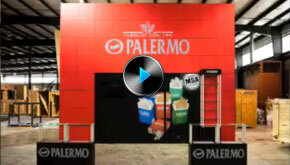 Perfect for portable media marketing in high traffic areas like schools, malls and entertainment venues. Also a great solutions for traveling sales teams. Holding content up to 50 pounds, the new MultiQuad Display Shelf is ideal for brochures, ipad stations and more. Because of the unique design of MultiQuad, the lifespan can extend far beyond that of traditional displays. With modular aluminum frames as the base structure, users can reconfigure in different arrangements to create a completely new display configuration. Ordering new Quads as the finishing touch, can give the exterior of your MultiQuad exhibit an entirely new appearance. MultiQuad owners can utilize our extensive rental collection to add on additional frames, Quads or accessories at any time without incurring the new expense of a new purchase. Modular seating available in single seats or benches are not only functional, they’re stylish. Create the perfect spot for storing supplies and personal belongings right within your MultiQuad exhibit. Available in two styles these portable podiums make the perfect talking station to interact with booth visitors. Brighten up your MultiQuad with backlit graphics - perfect for spotlighting your important message.